A safe ayurvedic medicine used in the treatment of Rheumatoid arthritis, Osteoarthritis, Arthritis in filariasis, Frozen shoulder, Sciatica, Lumbago, Gout and Chronic back-ache. It can replace steroids by controlling the pain and reduce swelling, morning stiffness, joint stiffness and it will give the sense of well-being and an improve­ment in general health. 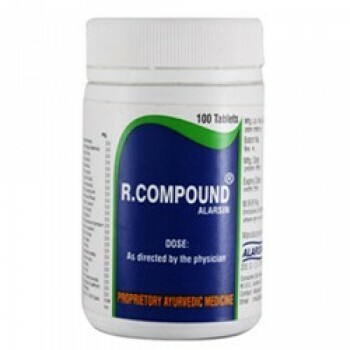 It has no side-effects such as suppressing the appetite, upset the gastrointestinal system or gastric erosions and is safe for long time use and it is well tolerated in older patients as well. It improves the blood picture. All inflammatory conditions (Skeleto-muscular, Neuro-muscular), Stiffness, Bodyaches, etc. 2 tabs. 3-4 times a day till satisfactory improvement. Then 2 tabs twice a day for 1 to 6 months. 2 tabs twice a day along with symptomatic relief drugs for 1-2 weeks. 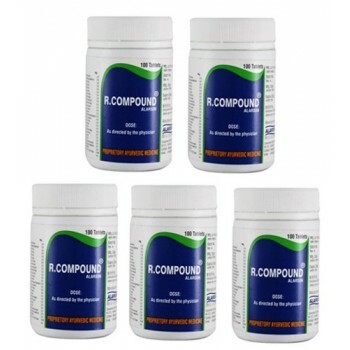 Then only R. Compound 2 tabs 3 times a day till satisfactory improvement. 2 tabs thrice a day for 1-2 weeks. Himalaya Herbals - Reosto 60 Tablets A unique complex herbal formula that helps support bone m..
Nisha Herbals - Chopchini K.P. 60 Tabletsfor joint & skin support, formulated with rare herbs on..
Himalaya Herbals - Hadjod 60 Tablets Called in Sanskrit Asthisamharaka and this means literally..
Divya Patanjali - Singhnad Guggulu Tablets 20 g Swami Ramdevji Medicine Divya Patanjali Singhna..
Sri Sri Ayurveda - Trayodasanga Guggulu 30 Tablets A very beneficial ayurvedic remedy for the t..
Himalaya Herbals - Rumalaya Forte 60 Tablets This combination of ayurvedic powerful herbs, espe..
Maharishi Ayurveda - Pirant 50 Tablets Pirant is a combination of Ayurvedic herbs for the treat..